* Washington right wing Mike Knuble makes his return to Philadelphia. Knuble spent the previous four seasons with the Flyers, scoring 114 goals in 310 games. Knuble said he has nothing but good memories of his time in Philadelphia, and was so excited that he arrived at the Wachovia Center 45 minutes before any of his teammates and sat in the stands. "I was bored at the hotel," Knuble told the Washington Post. "I figured it was a nice day so I should get out. I figured I might want to talk to a few people." Jeff Carter and Mike Richards came out during Caps practice to say hello to Knuble, who took a morning skate for the first time this season. "You try to treat it as another game, but of course there's some history there," Knuble said. "I'm looking forward to trying to get a win there. I had a lot of good years there. It's one of those games you'll remember for a while. So I guess I'm glad we're getting it out of the way early." * Capitals defenseman Jeff Schultz will play his first game tonight. Brian Pothier and Tyler Sloan will sit out. The Caps currently are carrying eight defensemen. * Semyon Varlamov, last spring's playoff hero, will start in goal for the Caps. * The Flyers will play defensemen Kimmo Timonen on the right side with Braydon Coburn. Chris Pronger will skate with Matt Carle. * Flyers coach John Stevens said he expects to have the same lines tonight as he did Saturday night in New Jersey. * Flyers backup goalie Brian Boucher was on the ice for all of practice today. He missed the first two games due to a lower-body injury. * Ole-Kristian Tollefsen, recovering from a hip injury that sidelined him for the season's first two games, skated this morning and could play. Tollefsen and Danny Syvret are splitting the No. 6/7 defense spot. PHILADELPHIA -- When the Philadelphia Flyers traded for defenseman Chris Pronger this past summer, they wanted to add a physical presence to their blue line, someone who could put an element of fear into attacking forwards. 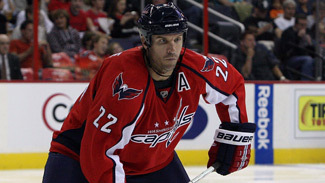 They got him for games like Tuesday night, when the Flyers host Alexander Ovechkin and the Washington Capitals. Ovechkin is off to another dynamic start, with 3 goals and 6 points in his first two games. The Flyers, meanwhile, have allowed just two goals in their first two games, and one of the reasons for that is Pronger, who is a plus-3 while averaging more than 26 minutes of ice time per game. "I think he's one of the top (defensemen) in the League," Ovechkin said of Pronger. "It's a good challenge for me to play against him. He's big, he's strong, he's tough." Pronger has only faced Ovechkin twice before, most recently Nov. 19, 2008. Pronger said when he was in Anaheim, he didn't match up against Ovechkin, but he's certainly seen enough to know what kind of skills the two-time Rocket Richard Trophy winner has. And he knows he'll be seeing a lot of No. 8 in white tonight. "He's got such a heads-up, quick release," Pronger told NHL.com. "He's looking to shoot at all times. At the same time, he's very creative and you just really have to take away time and space. It's no secret with the good players in the League -- you eliminate time and space, they have to make a decision quicker." Pronger said he'll be learning Ovechkin's moves on the fly, and he's looking forward to seeing in action in person. "I watch hockey, I watch the games," said Pronger. "I know what guys try to do and what they don't. You build a book on guys as you play against them and he's going to be no different. You need to get some games against guys to understand, more so their tendencies as opposed to what you see on TV. Sometimes they're a bit different." Caps coach Bruce Boudreau said there was no point trying to keep Ovechkin's line away from Pronger. "We're not going to try," he said. "It's too easy to change defense. We've seen it before with (Boston's Zdeno) Chara. It's easy for a defenseman because they can play longer shifts. They're going to get the matchup. That's fine. Pronger's a great defenseman. He played 27 minutes the last game. He's out there half the game anyway." Ovechkin said he sees going against Pronger as a challenge within the game. "It's always great when you play against good defensemen and good teams," he said. "If you beat them you feel much better than if you don't beat them."